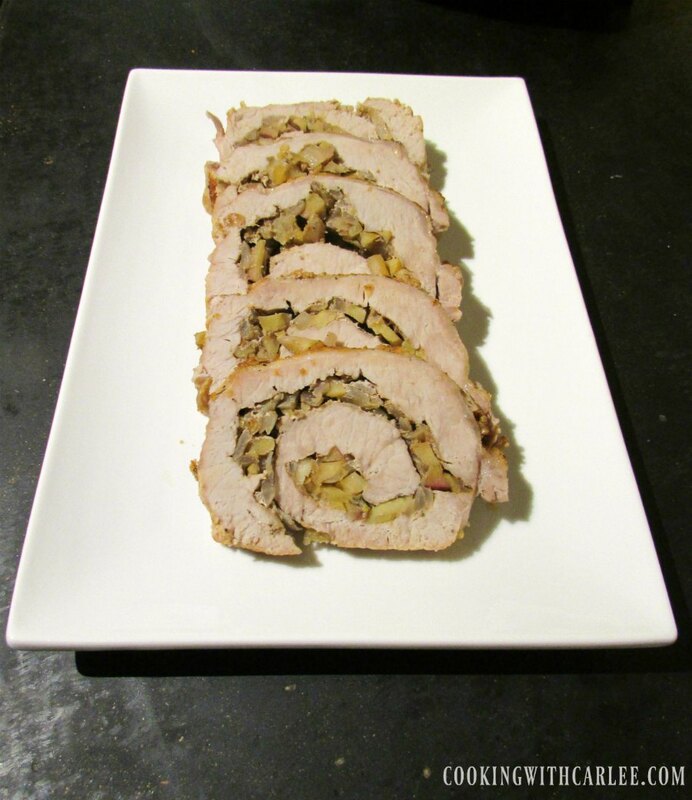 Pork loin stuffed with apples and rosemary makes for one delicious dinner. It is easier to assemble than you'd think too! MiMi normally hosts whoever is available for dinner on Saturday nights. She likes to get the kids together a cook a big meal. If we don't all show up, poor dad is stuck eating the leftovers all week long! I had been wanting to make some risotto for a while now. But if I am going to put that kind of effort into the side dish, the meat might as well be a little special as well. A nice pork roast scented with rosemary sounded good. Why not do some apples as well. Heck, let's shove it all inside the pork and add a little balsamic just to round it out. Why not?! So, I offered to host family dinner here tonight. If I am going to cook a hunk of pork and a big pot of risotto, I might as well share! Put half of the olive oil in a warm skillet and add onions and apple. Saute until tender. Add rosemary and garlic and saute for a minute. Use the balsamic to deglase the pan. Set aside. Slice the pork lengthwise almost in half. Open them up, and starting from the middle slice the pork from the middle almost to the edge on each side. Use a sharp knife and make small cuts, opening as you go. Lay the pork all the way out. Cover the pork loin with plastic wrap and pound any thick spots. Spread a thin layer of Dijon mustard over the pork and then cover with the apple mixture. Roll the pork into a tight roll. Heat an oven safe pan on the stove, add the remaining olive oil. Brown both sides of the pork loin. Cover and place in the oven for about 45 minutes or until It reaches 145 F in the middle. We enjoyed the pork loin and Mushroom Risotto tonight! Yum! This recipe just screams "Fall" cooking. I think I found my dish for the Welcoming Fall dinner party I host every year. Thanks for sharing at Inspiration Thursday! That sounds like so much fun! Now I want to throw a Welcome Fall dinner party! this looks so fancy , yet very doable! I think i can pull this off! I am so glad you share your talents with us over at celebrate 365 blog party!